Scorer of the winner against Boca Juniors in last season's Copa Libertadores final, Martínez moves for around US$14 million. South American player of the year Gonzalo 'Pity' Martínez has been acquired by Atlanta United, bolstering a team that won the MLS Cup championship in just its second season. United announced the long-anticipated transfer on Thursday. Martínez had announced he was leaving River Plate after the Argentine powerhouse won the Copa Libertadores last month and was spotted this week arriving at the Atlanta airport, where he signed autographs for fans. Terms of the deal were not released, but United reportedly agreed to a transfer fee of US$14 million – one of the highest in Major League Soccer history. It's another sign of the club's deep financial resources after setting numerous attendance records the last two years. Atlanta United averaged more than 53,000 for its league games last season, one of the highest figures in the world and more than double every MLS team except Seattle (40,641) and Toronto (26,628). Martínez becomes the team's fourth designated player, which means Atlanta will need to make an additional move to stay within MLS salary cap rules. The team has been discussing a possible transfer of MVP runner-up Miguel Almirón to the Premier League during the January window, but hasn't received a formal offer. Team president Darren Eales has said United is holding out for a transfer fee of around US$30 million. If Almirón stays with Atlanta, at least through the next transfer window this summer, the team likely will try to work out a loan for 19-year-old Ezequiel Barco, who is coming off a disappointing debut season. The team's other designated player is MVP Josef Martínez, who set a league record with 31 goals and recently agreed to a contract extension that will keep him in Atlanta through 2023. Pity Martínez's acquisition shows United still has a fertile pipeline to South American talent, even after coach Gerardo 'Tata' Martino left to take over the Mexican national team and was replaced by former Dutch star Frank de Boer. "I'm very excited to come to Major League Soccer and to join Atlanta United," Martínez said in a statement. "The club has shown a lot of trust in me and I'm looking forward to working with Frank de Boer and my teammates to continue making history at the club." He could be on the field when United makes its first appearance in the CONCACAF Champions League next month. The league season opens March 3. Martínez should be a good fit for Atlanta's high-scoring style that is anchored up front by Josef Martínez, who scored 31 goals during the MLS season and added four more in the play-offs. United defeated the Portland Timbers 2-0 in the MLS Cup final before more than 73,000 fans at Mercedes-Benz Stadium. "Gonzalo is an attacking player who can play wide or centrally," said Carlos Bocanegra, the club's technical director. "His abilities complement our style of play and we expect him to make a smooth transition to MLS." Pity Martínez made his professional debut in 2011 and transferred to River Plate in January 2015, where he scored 33 goals in 167 appearances over all competitions. During his tenure, the club twice won the Copa Libertadores, South America's top club competition, as well as a pair of Copa Argentina crowns. 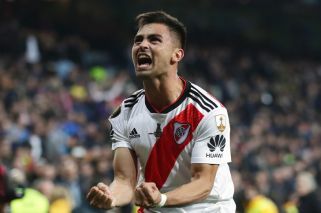 The midfielder played a key role in River Plate's run to its most recent Copa Libertadores title, scoring the final goal in River Plate's 3-1 victory in Leg 2 against rivals Boca Juniors for a 5-3 victory on aggregate. Martínez made his final appearance for River Plate at the Club World Cup in the United Arab Emirates. The team was upset in the semifinals on penalties by host club Al-Ain, but Martínez scored two goals to lead a 4-0 victory over Japan's Kashima Antlers in the third-place game December 22. He was awarded the 2018 Rey del Futbol de America, an annual prize to the media's choice for the top player in South America.